In 1957, Karl Leonhard(20) observed that, within the broad category of manic-depressive illness, some patients had histories of both depression and mania, whereas others had depressions only. He then noted that patients with a history of mania (whom he termed bipolar) had a higher incidence of mania in their families when compared with those with depressions only (whom he termed monopolar). In 1966, Jules Angst*21.) and Carl Perris(22) independently provided systematic family history data to support Leonhard's distinction, a distinction validated by an independent criterion—family history. Later genetic studies of this distinction proved less consistent with Leonhard's model, suggesting that bipolar and unipolar disorders may lie along a spectrum, with bipolar illness being more severe. 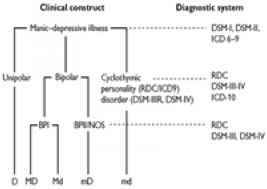 Figure 1 displays the evolution of the bipolar-unipolar distinction from Kraepelin's original conceptualization of manic-depressive illness. Fig. 1 The evolution of the bipolar-unipolar distinction from manic-depressive illness. D, major depression; d, subthreshold depression; M, mania; m, hypomania.